Eating clean, healthy, and whole foods can be tricky, especially nowadays when everything seems to be harmful to the body. Not to mention coming up with a balanced dinner plan! Preparing your own meals from scratch is a daunting task. To help you out, we have gathered some of the best and most delicious dinner recipes that follow the health guidelines of the 21-Day Fix eating plan. Some of these recipes take about 30 minutes to prepare but most of them take even less time. They are simple to make. And, to top everything off, these meals are healthy as well as very tasty. 1 What Is the 21 Day Fix Eating Plan? The latest diet craze that is blowing up online is the 21-Day Fix eating plan. This is a diet plan created by Autumn Calabrese who is a popular and appreciated fitness trainer. Through this eating plan, she has helped plenty of people to get fitter and their extra pounds. The 21-Day Fix eating plan claims to make your body fitter and give you the beach-body look you have always wanted. This is a complex and complete program that not only is providing some of the most effective workout schedule routines but also a precise portion control system that you can apply to lose weight in a healthy and safe way. It is not a standard nutritional system that will require you to follow a strict diet. Green container – for vegetables. As you might have imagined, the largest containers are the fruits, vegetables, and proteins ones while the smallest containers are those dedicated to oils, seeds, and healthy fats. If you want to eat something tasty without jeopardizing your diet or healthy lifestyle, you should definitely try this recipe in which you replace the classic taco shells with bell peppers. This recipe includes three green containers and one red container of ingredients. Ground turkey meat: one red container. *The ground turkey must be prepared and seasoned by following the guidelines written on the seasoning package. This is the best meat option for tacos. The first thing you should do is cook the bell pepper even before preparing the meat. You can either grill the bell pepper or cook it in the oven with a small amount of water and covered with foil. If you choose to prepare it in the oven, you should set the temperature at 350 degrees. It will only take around 15 minutes. Measure the right amount of taco meat with the 21-Day Fix meal plan red container. Then, pour the meat on top of the bell pepper. Take two green containers and use them as follows: fill one of them with lettuce and the other with tomatoes. Pour these vegetables over the taco ground meat, on the bell pepper. These are all the steps you need to apply in order to achieve a delicious and easy-to-make dinner. Enjoy! This quick and fresh dinner recipe fits almost all tastes and meal preferences. It is healthy and fresh. Also, it is compliant to those of you who follow certain diets such as paleo, gluten-free,21-Day Fix meal plan, whole 30, keto, and others. All you need to do to prepare this delicious and healthy dinner recipe is to chop up a couple of ingredients, combine them together in a salad bowl, and serve fresh. It will only take you five minutes to prepare an avocado shrimp salad. Chop up the avocado into small pieces or chunks. Then, place the chopped avocado in a medium-sized salad bowl. Dice the onion, cilantro, and tomato and add them on top of the chopped avocado. Finally, you can sprinkle salt and pepper on all the other ingredients. Mix them all together and take a moment to enjoy the dish you just prepared! *Bonus tip: if you squeeze a small splash of lime juice on the salad, it will only make it even more delicious! If you and your family love chicken and pie, then this recipe is the right option to try when it comes to 21-Day Fix dinner ideas. And, what other better way to avoid white flour, than using healthy ingredient options such as quinoa for the crust?! Ground thyme – one half of teaspoon; if you use the dried version of this spice, add one full teaspoon. Use a medium-sized kitchen bowl to whisk the egg whites with the whole eggs. Then, add the cheese, thyme, and quinoa. Stir until it is well-mixed and set the bowl aside for the moment. Preheat the oven to a temperature of 375 degrees. Meanwhile, use a small bowl to combine the following ingredients: milk, chicken broth, salt, pepper, and flour. Set it aside. Cover a frying pan with cooking spray, put the mushrooms in the pan, and cook them until they achieve a nice golden brown color. Don’t forget to stir frequently. Place the cooked mushroom in a bowl and set this one aside as well. Use the frying pan again to sauté the garlic along with the onion until they become translucent. Then, slowly start to pour the milk and broth mixture into the pan while stirring continuously. Bring the entire mix to a boil and cook it until the sauce becomes thicker. Stir occasionally and don’t forget to reduce the heat to a lower level. When the above mix is cooked, you can remove it from the heater and add the vegetables, mushroom, and chicken. In the last part of preparing this recipe, you must transfer the combination to a baking dish and arrange it better with a spatula. Pour the quinoa mixture on top and bake it in the oven for about 25 minutes. Although pasta might sound a little bit tricky if you are following a 21-Day Fix meal plan, using pasta in the amount of a yellow container is not much and it will not mess with your diet. After all, this meal planning system isn’t a crazy low-carb diet. For seasoning: salt and pepper. This recipe might include plenty of ingredients but its preparation process is fairly easy. Use a blender to mix the yogurt with the cottage cheese until you achieve a smooth texture. Add the pine nuts along with the basil and continue blending until all the ingredients are completely combined. Use a non-stick skillet in which you must add the olive oil and heat it a little bit before adding the zucchini and minced garlic cloves. Finally, you can add the chicken, pasta, pecorino and sauce mixture in the pan. Remember to add salt and pepper to season everything to taste. Before listing the ingredients and the preparation steps of this recipe, I must confess something: the secret behind this dinner idea’s flavor and juiciness is in its marinade. My mouth is already watering so let’s not waste another minute and go directly to how this recipe is made and its required ingredients. First and foremost, preheat the oven to a temperature of 375 degrees. Add all the ingredients listed above expect the chicken in a bowl and stir them together. Use a Ziplock bag to marinade the chicken thighs with the mixture made from all the other ingredients. You can keep the meat in this marinade up to a whole day in your fridge. Next, pour the chicken along with the marinade into an oven dish and bake them for approximately 30 minutes. After leaving the chicken to rest, you can serve it with lemon slices. 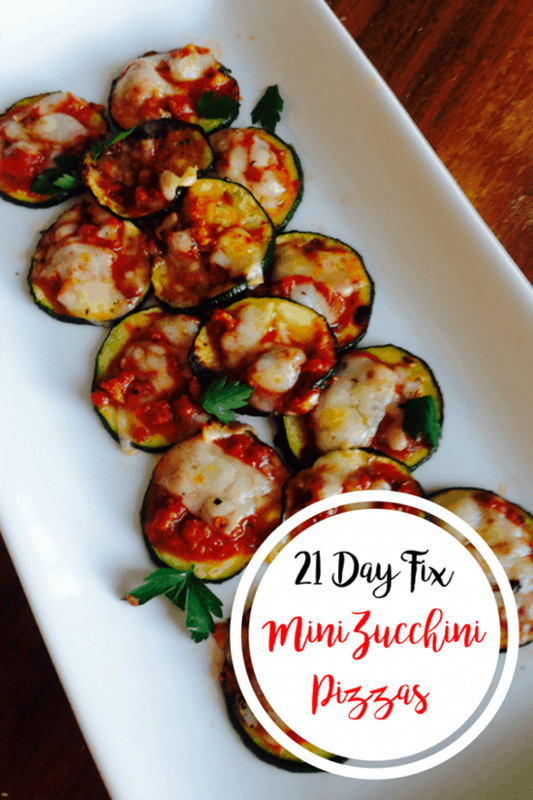 Instead of eating a classic pizza which has way too many calories to fit into a healthy lifestyle, you can easily prepare mini zucchini pizzas. Set the oven to a high temperature. Cover a baking pan with parchment paper and spread the zucchini out on it. Then, spray the olive oil on top and sprinkle the crushed red pepper followed by the garlic powder. Broil the zucchini for a couple of minutes until it gets brown. Take the pan out of the oven, flip the slices on their other sides and season them again. Next, you must top each slice or mini pizza with cheese, sauce, and oregano. Place the pan in the oven again until the cheese melts and becomes golden. We will end the list of the best 21-Day Fix dinner recipes with an easy option: rainbow veggie kebabs. In the end, you will have a rainbow of healthy veggies. One kebab translates into two teaspoons of oil and two green containers. You must chop all the veggies into slices. Then, stick them on skewers, one by one. Create a simple marinade from olive oil and lemon juice. Use a kitchen brush to spread this mixture all over the veggies. You can also sprinkle sea salt on top of everything but this is optional. Grill the veggies and flip them from time to time until they become brown on all sides. So, now that you know some of the best 21-Day Fix dinner recipes, what is stopping you from leading a healthier life and achieving your weight loss goals? All these recipe options are easy to make, healthy, and, most importantly, tasty. They will boost your metabolism while also providing all the nutrients your body needs.